Caldeum on the world map. 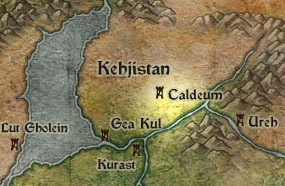 Caldeum is one of the largest cities in Sanctuary, and has always been the capital of trade. It appears in Act II although it's not the first settlement you reach. Kamyr, on the way before meeting Belial. A regular guard with shield and some officer. The city was only recently occupied by the Kehjistan government following the fall of Kurast. 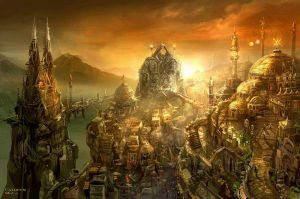 Caldeum was originally ruled by the Trade Consortium Council, but Emperor Hakan united the city under his banner, before he became ill.
Caldeum hosts both the Vizjerei mage clan as well as the Yshari council of sorcerers. Under the Yshari Sanctum, some sort of infamous chambers called the Bitter Depths can be found. "Caldeum was once the proudest city in all of Kehjistan, the trade capital of the entire world. Caldeum was never seen as the heart of the empire, even though it rivaled Viz-jun, and later Kurast, in size, and those who called Caldeum their home liked it that way. -- Let Kurast see itself as the center of the world, they would say. We'll keep our free exchange of goods, currency, and ideas, thank you very much. I was initially dubious when the emperor of Kehjistan emerged to confront this quickly deteriorating situation. But the charm, leadership, and intelligence that he brought to bear as he quickly resolved the conflict between our council and the Kurast nobles were nothing less than masterful. When the people fully supported him in his role as our emperor, I saw this achievement as nothing short of a miracle. Though we had always been part of the empire of Kehjistan, and therefore under his rule, we had always behaved as if we were a free entity, beholden to no one but ourselves. It truly seemed at the time that catastrophe had been averted, but now it has become all too apparent that it was merely hidden beneath a thin veneer of civility. -- This veneer began to shred when Emperor Hakan became ill. His influence started to wane, and the mood in Caldeum changed with his health. As he got worse, so did our once fair city. When he died and his ineffectual child heir took the throne, Caldeum began to circle the abyss. Our list of ills seems never-ending: the state of our downtrodden and the slums they are forced to live in, our incompetent leadership, the re-emergence of the intolerant Zakarum, and their quarrels with our mage class... I could go on for pages. It is all too much for one to bear, really." Many hundred years ago, Caldeum has a military outpost in the Borderlands named Lut Bahadur, which was put in place. It was located there to keep the Lacuni (cat people) in their cliff dwellings safely away from Caldeum. 400 years ago, precious minerals were found in the Stinging Winds, and was protected by the might of Caldeum's Dune Guard. Hakan II withdrew the Dune Guard and now no caravan is safe, and refugees from the Borderlands beat against the gates of Caldeum in an endless wave of displaced humanity, desperate for the salvation Caldeum once provided. A selection of images showing Caldeum. This page was last edited on 5 October 2014, at 10:39.